At 8am on a beautiful November morning, I was sitting in the Cosmopolitan’s Chelsea auditorium in Las Vegas, wondering how in the world I was going to write about some of the bold moves that Dassault Systemes has been making these past few years, at least in a way that would make sense to an audience whose principal interest with this blog tends to be… marketing, digital and social. For the better part of that morning, I listened to speaker after speaker – starting with Fast Company founding editor William Taylor to Bernard Charles, CEO of Dassault Systemes – trying to find the common thread at this event (#3DXforum), the nugget of wisdom, the takeaway insights. The problem is… there’s just so much to talk about. Where to start? 3D retail virtualization? retail collaborative design? The internet of things? Cloud-based systems of systems? Why am I here? What’s this all about? How do I connect all these dots? I guess the best place to start is… at the beginning. 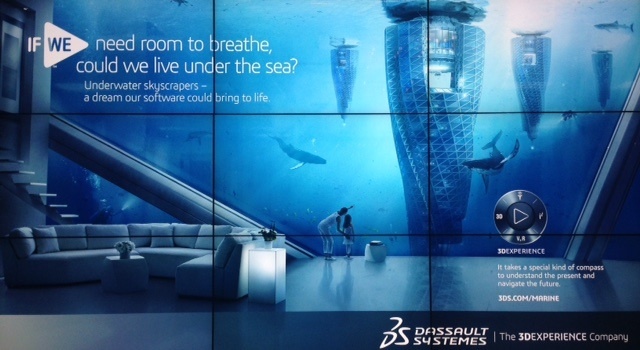 Dassault Systemes is, at its core, a technology company. A software company. The virtualization and 3D experience company. The guys behind SolidWorks and 3DXcite. But these past few years, the French innovation accelerator has been evolving into… more. 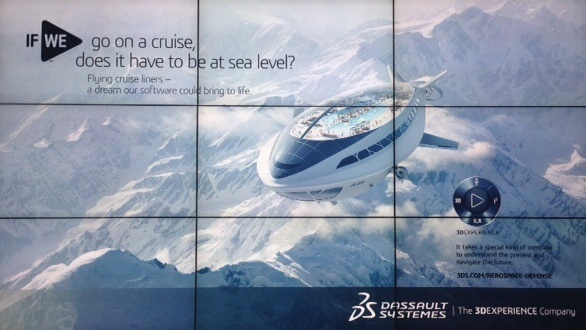 The best way to explain where it is now is to think of Dassault Systemes as more of a ‘we can help you turn your ideas into reality faster and better’ company. What companies tend to buy into first (or at least ask about first) is the tech, because it’s what you can see and touch. It’s a line item. It’s easy to point at and say ‘this is what I need.’ And in a way, it’s the cold hard center of the answer behind the most elementary business question of all: ‘what do you do?’ But at the core of Dassault Systemes’ capabilities lies a more fundamental value. It plays a far more critical role in the realization of dreams and ideas: Dassault Systemes provides the platform that makes better, faster, smarter innovation possible. It provides the sandbox and the sand, even the rakes and the buckets, and it does it in a way that, more often than not, will blow your mind. Not very long ago, I wrote about the future of analytics – cognitive computing, the cloud, and IBM’s Watson, – about computers that think and learn and can have conversations with you, computers that can anticipate questions and interact with users seamlessly and in real time, thanks to the cloud. Revolutionary stuff. What I am seeing in Dassault Systemes’ ecosystem is the same kind of technological shift, the same kind of game-changing evolutionary leap in innovation-driving tools. And what’s special about it isn’t that it’s particularly new or original since science fiction writers played with these ideas decades ago, but rather that it’s real now and that it actually works. I want to dive deeper into the ways that Dassault Systemes is helping solve problems for CPGs, retail clients, designers, architects, surgeons and space monkeys, but we aren’t going to talk about that today. I am going to walk right on by the tech carrot, the easy nugget, the inevitable holodeck references, the glitter and the flash. I’ll come back to all of that later, in another post. Today, I want to start talking about something else: innovation. Innovation as a process. Innovation as a business model. Innovation as a mentality. Innovation for the sake of making things better just because we can and because we should. Innovation as a vehicle for progress and value acceleration, for quality of life improvements and survival, for profitability even… and, perhaps most importantly, innovation as a vehicle for turning crazy-cool ideas into manifest reality. Bear in mind that when I talk about crazy cool ideas, I’m not just talking about the next gadget or talking refrigerators (although I would love a talking refrigerator, especially one with some snark to it). I am talking about being able to 3D-print organs when yours start to fail, building underwater seascrapers, mining comets, designing self-driving cars that run on fuel made by algae, erecting entirely new kinds of cities and power grids and water systems. I am talking about exploring the oceans again, and building underground habitats, and taking to the stars. This isn’t pie-in-the-sky stuff, by the way. These are the kinds of projects that are well within the range of the sorts of capabilities touched by Dassault Systemes’ sand box. It’s the kind of stuff that makes you dream a little (and even a lot), and gives you hope also. Hope that the future will actually be better, not worse; hope in the belief that we haven’t peaked as a species; hope that we will find cures for cancer and HIV and Ebola and the other thing; hope that climate change will be an opportunity rather than a curse, that the next giant volcanic eruption or asteroid impact won’t be the end of us – innovation, therefore, retasked as a vehicle for hope and progress and better things to come. I think it’s important to start talking about that again, even here, on a blog that doesn’t always look at the very very big picture but probably should. And it’s weird that we aren’t really having that discussion anymore, since innovation is all around us every single day. We’re so connected and we have access to so much information and data… And yet we’ve sort of lost that thread. It isn’t really part of our daily experience to look to the sky anymore, or even trust science, which is really odd to me. I think it’s gotten away from us a little, the insight that it’s all connected and that innovation is innovation, whether you’re developing a new drought resistant variety of corn or rigging a home-made system to keep leaves from plugging up your gutters. The processes and methodologies and tools used to bring you the next tablet and the next biometric wearable are also being used to cure cancer and fix spinal injuries. The process and methodologies and tools used to design the perfect car and the perfect retail experience and the most awesome custom-made taco are also being used to develop new fuels and invent entirely new types of intelligent, self-maintaining buildings. Innovation is alive and active all around us. We’re all innovators, each and every one of us, and I know that given the right circumstance, the right motivation, the right stimulus, we would prove that time and time again. It is in human nature to evolve and look for modes of improvement. I mean look at us: even our dysfunctions are innovative. There’s a lesson in that. The point being that when someone blurts out a cliche like “if you can dream it, you can build it,” that actually isn’t as vacuous as it sounds. I mean… you have to get past the pipe dream stage, but if you do, if you take that extra little step, you can realize that there has never been a time in human history when it was more true than it is now: if you can dream it, you can virtualize it, and from there, you can experiment with solutions to problems and hurdles and question marks. And from there, you can turn unknowns into knowns, and if you do that enough times and with enough diligence, that dream can become a reality. That idea can manifest itself as a solid, working thing: the self-sealing fabric, the lighter-than-air skyliner, the bionic eye, the scratch & sniff touchscreen, the custom-printed antibiotic. If you can dream it, you really can build it. And with the platform I am learning about this week, we’re looking to a horizon that is not limited to MIT or Silicon Valley, or limited to apps and social networks and head-scratching valuations. We’re talking about toolkits that will, in the next few years, democratize innovation; toolkits that will allow some kid in Mumbai or Monrovia or Rio to design-build engines and solutions and devices that may save their little sister’s life or bring clean water to their neighborhood or keep millions of people fed, and do so not in the shadow of industry giants but alongside them. We’re talking about a coming wave of innovation matched in speed and volume and civilization-changing ramifications only by the imminent challenges ahead, from climate change and looming energy crises to water shortages and the inevitable diffusion of power around the globe. And the thing is, we have a shot, a real shot at coming out of the next 30 years in much better shape than we are going into them, and that’s pretty extraordinary given the mood everyone has been in since the markets went south in 2008 and the polar ice caps started melting. There’s help on the way, and the help is us; and if you can manage to step away from Facebook and facepalm-inducing comment threads long enough to bump into some of the world’s dreamers and problem-solvers, and they far outnumber those among us who have forgotten how to look at the world with curiosity and awe, that won’t seem nearly as scary as it sounds, I promise you. Actually, it’s pretty damn exciting.